Here we are at week three of, the One Room Challenge, the event that Linda of the popular Calling it Home blog host for designers and bloggers alike. We all have 6 weeks, (really 5, revealing week 6) to implement our design in 1 room. Have a look at my week one plan and my week two progress of my living room area. This week is all about SETBACKS! Well, I have more than a few! Ideally, I'd like an open airy feeling that a white sofa has the tendency to lend to a room. Now, for the upholstery downers! First up, the barstool seats. The navy patent leather is gorgeous but something's WRONG!!! Can you see it? The top and bottom right corners are NOT perfectly rounded like the top and bottom left corners are. Nothing that can't be rectified, BUT, it takes TIME!!!! 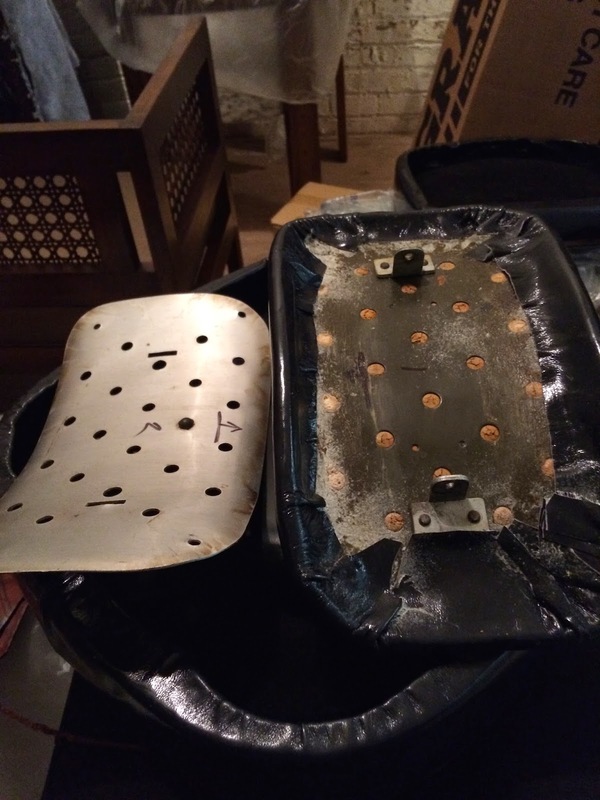 PLUS, I was so disappointed MAD to see that Mr. Upholsterer altered the design of the seat of the stools! I was too shocked and upset to take a photo of it. I wanted the stools upholstered EXACTLY like they were originally, however, Mr. Upholsterer apparently thought they need top and bottom piping!!!! Can you BELIEVE IT???!!! Now, I'm all for creative license and am even open to design negotiation, but, CALL ME FIRST- BEFORE you cut!!!!! Of course, I had a limited amount of genuine patent leather- which you NEVER find. I bought this patent 7 years ago and, OF COURSE, the company does not have any more; so top & bottom piping it is! You thought I was finished talking about the stools, right? No! During my inspection, they FELL APART!!! Mr. Upholsterer failed to replace the screws! Now, I was REALLY upset by this point because this particular upholster works with one of THE most renown auction houses in the country- who referred ME to HIM! At this point, I'm not feeling valued by Mr. Upholsterer and returned the stool backs to be reworked and reattached. *Footnote - The stool backs were reattached with MISMATCHED screws! Now I KNOW I'm not valued by the upholsterer. I asked the owner, "Would you treat Mr. Auction House like this?" Still haven't received an answer to that question. Bought a simply beautlful rug, from an eBay seller that's damaged (even though I inquired about damages & was told there were none). 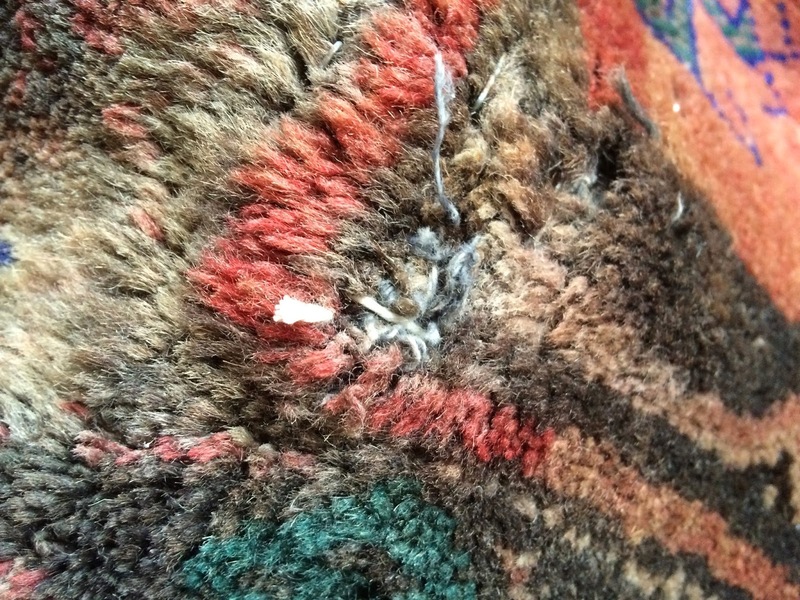 My 2 good rug/carpet dealer friends are ALWAYS telling me not to buy rugs from eBay or etsy! They are extremely old school gentlemen and believe in the "process" of shopping for a rug. I believe in the "process", as well; however, I told them that I HAVE to buy rugs from eBay and etsy because $50,000 rugs or even $5,000 rugs, like they sell, are currently out of my budget!!! Hellooooooooo!!! 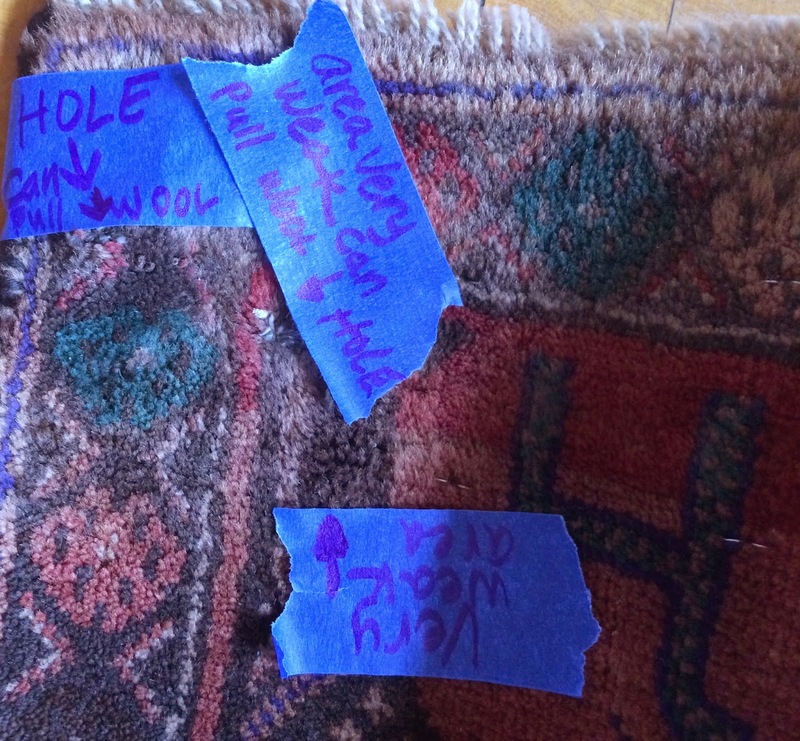 My one rug dealer friend, Amir, was so angry when I showed him the rug that he told me to, "Return it AT ONCE!" I admit, I actually felt my heart sink a little, when he was ordering me to do so. He gave me a script to follow and the dealer agreed to repair the rug and pay for the return shipping. Thank goodness I have another rug I can use in its place if I don't receive it before the reveal. 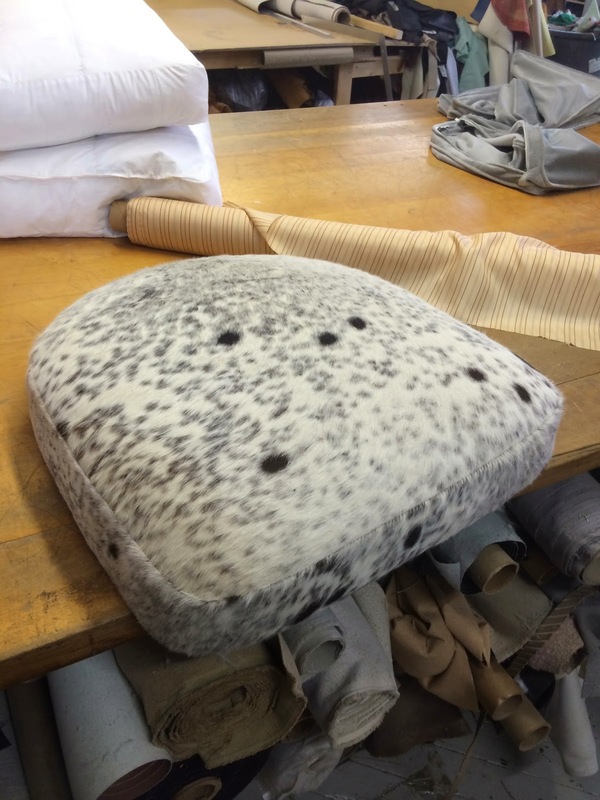 Back to the upholster! The cane-back bench was delivered. However, they did not stain it; it was glossed up really nicely, but not stained. 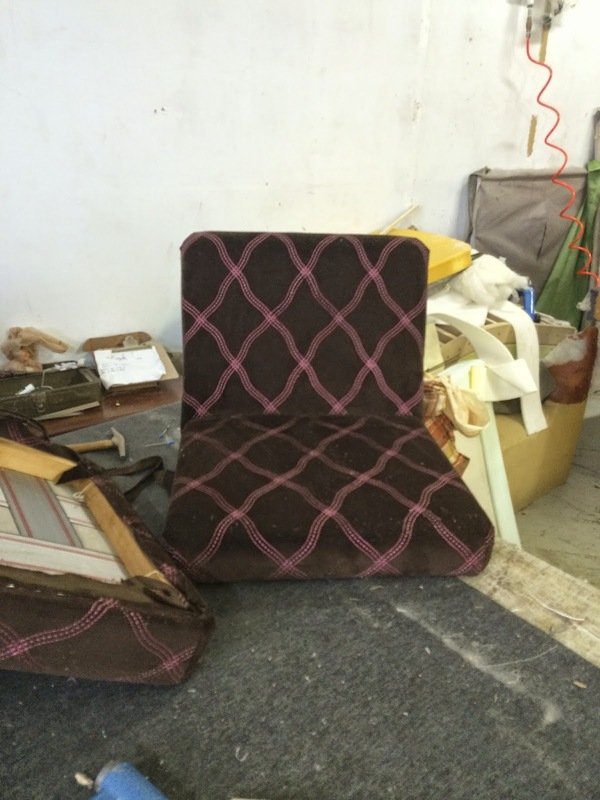 Mr. Upholsterer and I had a little back and forth about it- I could not believe it! I told him that I paid for the refinishing/staining of the bench- after he confirmed with his son, he agreed to stain the bench. OMG! Notice the seats on the right? Well, those are mine and they are HORRIBLE!!! I LOVE the fabric & might even have a jacket made out of it but, it's all wrong for the style of chair and will be too dark with my already too dark sofa! The second element wrong with the seats is the design or style of the seat. It's too boxy for the design of the chair and needs to be more tailored. 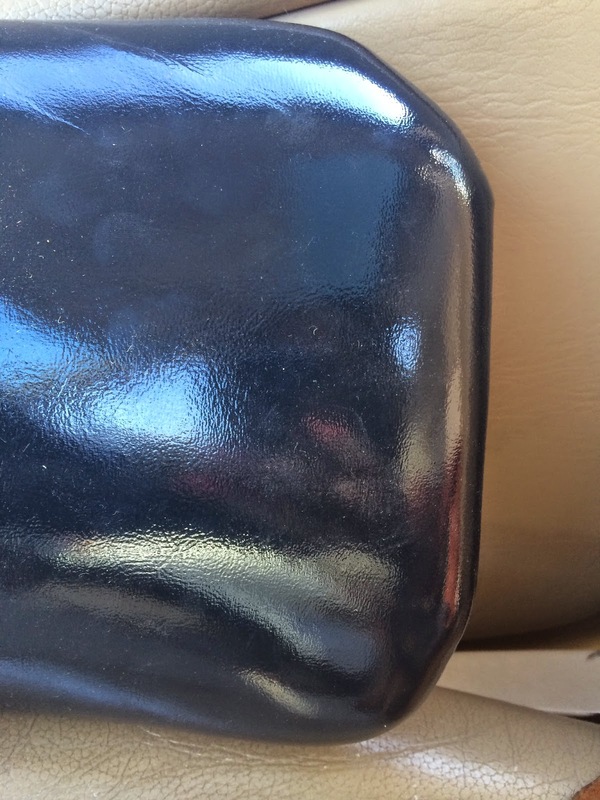 Look at how thick the seat is- it's got to be 4"! Too thick and that fabric is NOT helping. The new upholstery I chose befits the style of the chairs. It's a metallic linen blend called, "Patina" by Robert Allen; it's part of his "Alchemy" line. It's such a pretty and versatile linen blend. I'd wear this as a jacket as well! I feel like I need to explain my reasoning in selecting the chocolate velvet with pink embroidery fabric. Well, I had an emotional reaction to it. Ha! It's a Brunschwig & Fils fabric, I thought it was luscious and would compliment the kilim I plan to use in the area. Honestly, I was so emotionally entangled that I didn't even consider it in combination with the mahogany sofa. This is not my mirror. My mirror looks exactly like this one, except, my mirror is stained espresso and the glass is broken. I could hardly believe it. For the past 6 years or so, it's been in my old bedroom at my mother's house, wrapped in a old comforter and leaning against a radiator. Perhaps it was the heat that made it crack? Duh!!! I didn't think it got THAT hot! The glass used to make the mirror was over a 1/4 thick, which made it terribly heavy; it was stamp dated "May 1952" on the back. I'll just wait until I return to Duluth to have it replaced with a thinner, lighter weight mirror. Now for the uppers of the week! 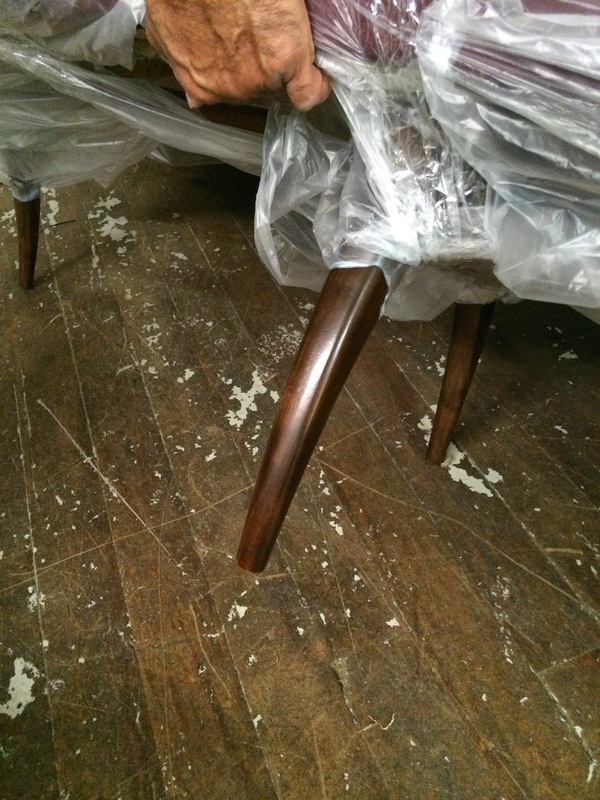 The legs of the Bertha Schaefer bench are divine in espresso! The brass Chiavari chairs turned out wonderfully! 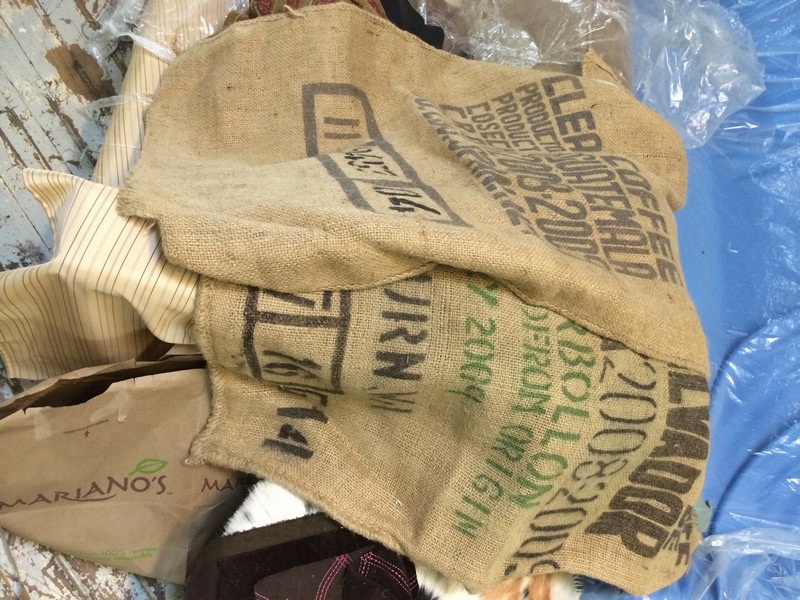 I LOVE the bold, graphic choice I made in selecting burlap coffee bags for the brass beauties- truly rough and refined. This one is a downer mixed with an upper. 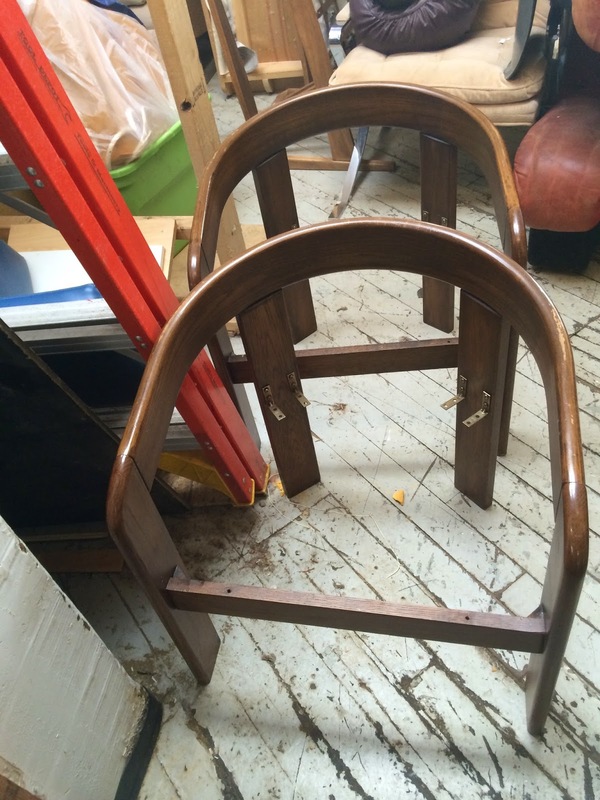 Remember, from week two, my Scarpa-esque chairs that I'm going to ceruse? The seat's busted! 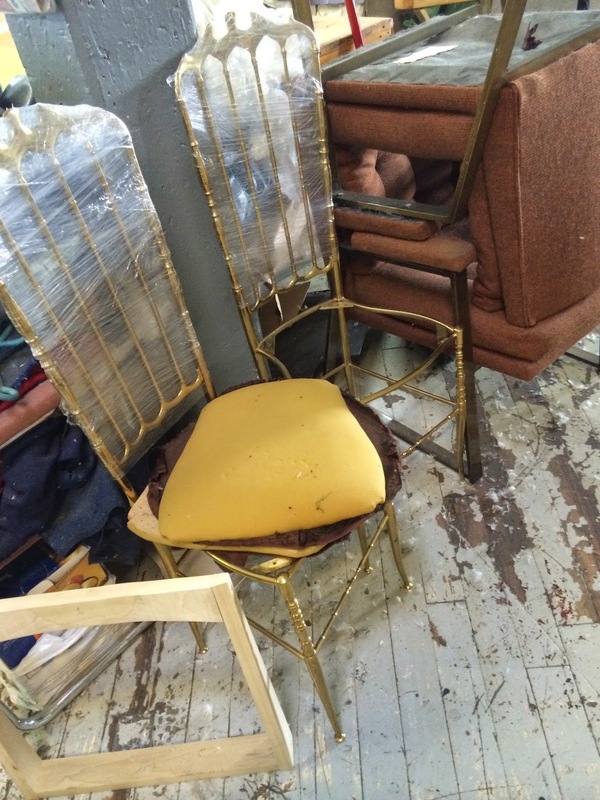 Mr. Upholsterer says, he can fix it, no big deal! Thank goodness! I'm in LOVE (aren't I always?)! The cowhide was THE right choice for the seats!!! Additionally, the right choice to compliment the ceruse project! They will truly look out. of. the. WILD! Response from my girlfriend when I sent her an example of cerused wood. PRICELESS!!! Exactly what I'm going for! Once again, I'm humbled by your visit! To see my previous weeks, look here: week one; week two. 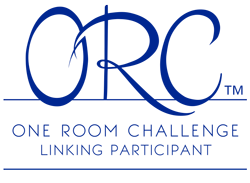 I look forward to seeing you next Thursday, week four, at the One Room Challenge! Sorry for all your troubles. Sounds like you might need to find a new Mr./s. Upholsterer soon. Better luck this week. Erin, you are so right! I broke up with Mr. Upholsterer! What Erin said! If I had been impressed before with what you are attempting, am even more impressed by how you are handling this. Somehow I think you are going to pull it off! It's a pity because they are SO good (craftsmanship wise) & FAST! But, I. Just. Can't! Dislike correcting you but, based on your experience, they aren't. Denise!!!! YOU ARE SOOOOOO RIGHT!!!!!! (I've capitalized, but you can't tell due to this weird font) I should delete my own comment! LOL! Actually, I haven't even share one HALF of the drama!!! 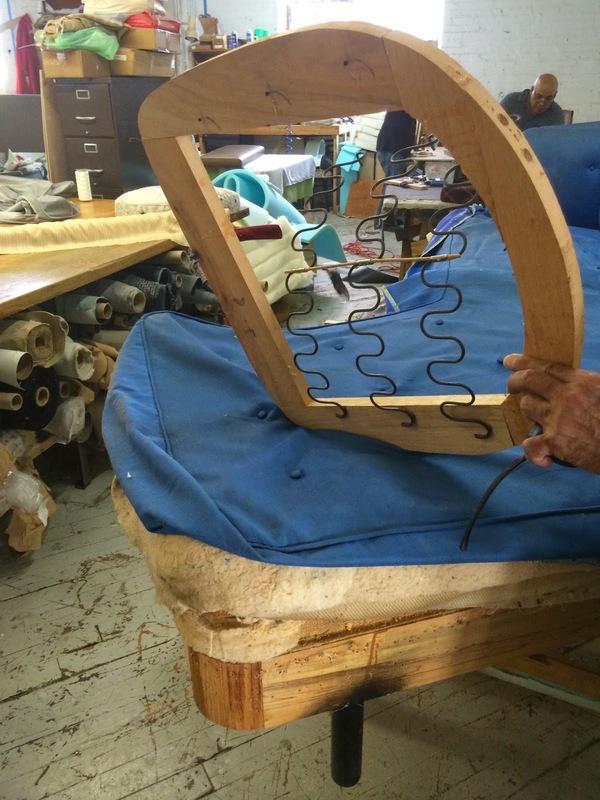 When you bring an upholsterer 17 pieces they SHOULD put their BEST foot forward! If you bring them 1 piece they should put their best foot forward!!! Hi Daena, I'm only now trying to catch up with all of the ORC posts. I am infatuated with your living room project! Talk about ambitious! It makes my head hurt to read about your missteps, mishaps, and Mr. Doesn't-Seem-to-Listen Upholsterer. I think we should hook you up to a brain scan. Your creativity could possibly light up the East coast. Truly, I cannot wrap my heard around your insight and vision. The scope of possibilities is mind boggling. Hang in there, Honey. (I'm Southern.) I look forward to following your every step! Fingers crossed for an awesome Week 4 of the ORC. Hi Linda! Thank you so much for visiting me, I'm so appreciative!!! I broke up with Mr. Upholsterer! He made my head hurt like you don't even know! I didn't even tell the whole story! I'm just glad that he finished the pieces! Please come back, next Thursday, I moved everything to Duluth, this weekend, and am so overwhelmed with the amount of stuff I have!!! I'm working, night and day, just to be able to walk around this apartment. I'm your southern sister, born in NewOrleans, and all my family lives there! Thank you for crossing your fingers for me, I need all the positive vibes I can get! LOL! Again, Linda, I appreciate your visit and well wishes, see you on Thursday! Daena, comments not enabled for Week 4 and OMG YOU ROCK! You just might pull this off! Thank you so much, Denise! Week 4 comments are now enabled. Thank goodness for you! Well, at least I've made it to Duluth! LOL! The move let me know that, in order to keep my pressure low, I needed to forgo some things on my list. I'll just blog about those DIY's in later posts. I'm REALLY all about ease & had to cut some projects to keep this challenge "fun & easy". I'm so delighted you stopped by, this week. Again, thank you so much! Sorry I'm too lazy to go past on week 4.